Below are some choices for couples. Any of these popular massages make a great choice for couples. These couples massages are done in the same room with you close to each other but not normally directly side by side. 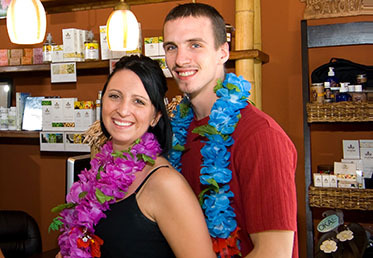 Couples’ Maui Relaxation Massages – Focusing on relaxation, this couple’s massage is much more than a Swedish Massage. We combine aromatherapy, hot towel treatments, Swedish, Hawaiian Lomi Lomi, and more into the Ultimate Relaxation Experience! Couples’ Nui Premium Full Body Massages – This custom massage can be anything from relaxing to deep tissue. Just tell the therapist what you need and he or she will customize the massage to address your specific needs. Couples’ Lomi Lomi Massages – This traditional Hawaiian Massage is a great choice if you want to share an exotic massage together. Lomi Lomi is performed on the entire body at once and can focus on relaxing or deeper therapy depending on your needs. Couples’ Hot Stone Massages – Your therapists will massage you from head to toe with volcanic hot stones. Great for sore muscles and relaxation.